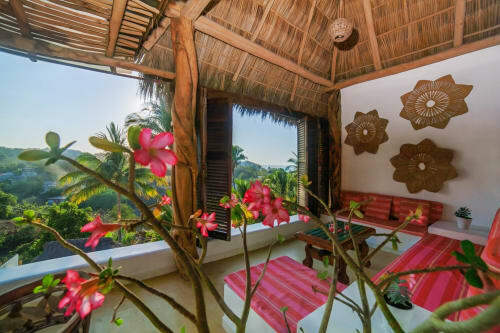 Villa Amor Honeymoon Suites in Sayulita, Mexico, will entice anyone looking for a romantic and private honeymoon suite for their Destination Wedding in Sayulita. The Riviera Nayarit is the perfect wedding and honeymoon destination and at the Original Villa Amor in Sayulita, where elegance meets the beach, you will find luxury, comfort and romance within your private and exclusive honeymoon suite. Please utilize the contact information box on the right, either by email or telephone, and we will assist you with booking your perfect stay. For Wedding and other special events, please view our Wedding and Event Venue page. Choose between cozy studio suites, Villa Bonita or Villa Peninsula, or more spacious accomodations in a one-bedroom luxury villa, Villa Serena. All honeymoon suites within Villa Amor Hotel provide expansive and breathtaking ocean views, beautifully furnished villas, spacious exterior terraces, select villas have jacuzzi or plunge pool per request, daily maid service, kitchette and fiber-optic, high-speed WiFi Internet. Villa Amor has added a beautiful new swimming pool and yoga center, and has one of the most romantic outdoor beachfront dining experiences at Si Señor Restaurant and a great bar to enjoy. Make Villa Amor Honeymoon Suites the perfect beginning to a happy life together. Villa Amor Honeymoon suites are sure to enchant our guest lovebirds. Villa Bonita: Villa Bonita meaning "pretty" is an extremely popular honeymoon suite. It is the most romantic villa, many times it is where the bride and groom stay for their wedding. Situated near the top floor in the most private and desirable corner of the property, Villa Bonita features an expansive open corner terrace, with incredible views of the Sayulita Bay–not only from the terrace, but from the ethereal king size bed with crisp white linens. The elegant outdoor furniture imported from Bangkok and the marble terrace of this 1,000+ sq. ft. oasis cap off a very special experience that will provide lasting memories. 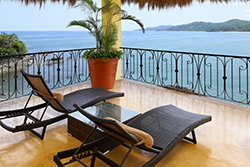 Villa Peninsula: A luxurious, private and romantic villa with phenomenal views of the entire Sayulita Bay. Upon arriving to Villa Peninsula at Villa Amor Hotel, you will find comfort and romance in the beautifully decorated and charming atmosphere that Villa Peninsula provides couples and newlyweds. This love nest featuring an outdoor jacuzzi for two raises the bar for sophistication, luxury and indulgence. Your honeymoon in Sayulita in this beautiful villa will be a memory you always treasure. Villa Serena: Sayulita is known for having a slower pace of life and when on your honeymoon, you will leave the bustle of everyday life behind where it's just the two of you. This is the perfect villa to enjoy the beginning of your life together. 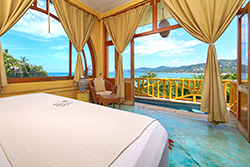 Villa Serena features an expansive open terrace, sweeping views of Sayulita Bay, a king bed with crisp white linens, and a gorgeous, oversized bath tub for two. You’ll never want to leave the luxury of this room if you don’t have to. 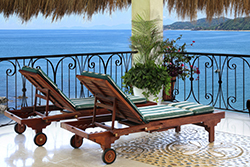 Enjoy a perfect honeymoon in Sayulita at Villa Amor Hotel, where elegance meets the beach. Before booking your stay, please be aware Villa Amor is in a beautiful, yet unique environment. Villas are located on an oceanfront hillside in jungle terrain. Most of our villas provide tropical, open-air living environments with air conditioning in the bedrooms only. Villa Amor is not a gated, "behind the walls" location. Upon leaving the hotel property, you are in a traditional Mexican fishing village that has grown to embrace a boho-chic, world traveler vibe. We really enjoyed our stay at Villa Amor in the Penninsula Suite. We typically stay in four and five star hotels and this did not disappoint. This is the best view we have ever had on a vacation. You have the option of sleeping in an open air environment or you can close the all glass walls for a more indoor feel. We left things open so we could hear the waves all night long. The decor and furnishings are wonderful. Unlimited filtered water and a fridge in the room. A view of the bay is visible from the bed or from the front porch. Free yoga for hotel guests offered three days that week and it was wonderful. The pool is very nice. We ate at the restaurant for breakfast and it was great. The staff was very kind and personable. 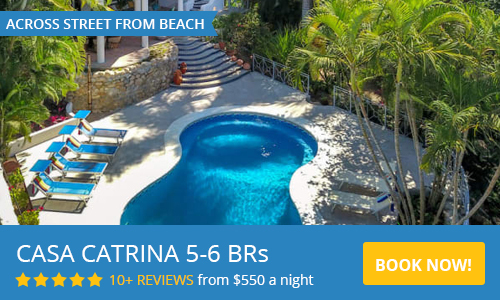 Just steps to the beach and a five minute walk along the beach into the heart of Sayulita. It's far enough away from the hustle and bustle to find peace but close enough for great food and fun. We rented surfboards daily, danced to a salsa band at Don Pedro's, ate fish tacos at "the real fish taco" and had lovely Mexican food at Carmelita's. We love Sayulita and Villa Amor! We will return. Mexican Citizens with proof of citizenship receive a 20% discount on regular rates any time of year, based on availablitly. Cannot be combined with any other special offer. Los ciudadanos mexicanos con prueba de ciudadanía reciben un 20% de descuento en las tarifas regulares en cualquier época del año, según disponibilidad. No se puede combinar con ninguna otra oferta especial. Villa Amor Honeymoon Suites nightly rates are in US Dollars. Minimum 4 night stay. 16% IVA (VAT tax); and an additional federal lodging tax of 3% will be added to your invoice. High Season Dates: January 6 - June 30, October 1 - December 15 Holiday Season Dates: December 16 - January 5. Low Season (summer) Dates: July 1 - September 30. For inquiries, please utilize the contact information box on the right, either by email or telephone. Our reservation experts are standing by to assist you with your reservation and to help you choose the villa that is perfect for you. Villa Peninsula Rates: $263.99 USD per night High Season, $311.60 USD per night Holidays. $164.45 USD per night Low Season..
Villa Serena Rates $259.66 USD per night High Season, $324.58 USD per night Holidays. $164.45 USD per night Low Season. Villa Bonita Rates $294.29 USD per night High Season, $376.51 USD per night Holidays. $194.75 USD per night Low Season. For information regarding weddings and special events, please view our Wedding and Event Venue page. Need a wedding planner? Please view our Villa Amor Weddings page. CATEGORY A: If you have booked 1 (one) or more Villas with a full Payment at confirmation, you will be entitled to any on the following options based upon how many days notice we receive of your cancellation. Option 1: Receive a refund minus the cost of one night per villa minus fees (taxes and 4% bank commission). Option 2: A 100% credit to be used within 1 year toward another reservation (excluding blackout dates as Christmas and New Year’s). Option 1: 50% refund minus fees (taxes and 4% bank commission). Option 2: 100% credit applied to future stay to be used within 1 year (excluding blackout dates such as Christmas, New Year’s). 75% credit toward future stay per villa or 25% refund minus fees (taxes and 4% bank commission). Zero credit and zero refund. CATEGORY B: If you have booked 1 (one) or more villas and chose 50% payment at confirmation. Final payment is due 30 days (90 if attending a wedding) of your arrival date, via Credit Card or PayPal, unless alternative arrangement is made directly with our office. No refunds or credits are available with this option. If you chose Category B and later followed up with full payment this does not change your original choice and you will remain in Category B. Option 2: Receive a full credit for the cancelled night(s) to be used within 1 year toward another reservation (excluding blackout dates such as Christmas and New Year’s). Refund will apply only if we are able to re-rent the unit for the canceled night(s). Refund will be less fees (3% tax and 4% bank commission), and depends upon the rate we are able to recover. Cancellations made for night(s) with less than 60 days notice will not receive a refund. Important: If you are unsure of the number of nights you require, please consider carefully, as we cannot often issue a refund or credit for cancelled nights. Please book only the nights you are certain you need, 3 night minimum if a weekend is included. If you only book 3 nights we can often extend your stay with at least 60 days notice. Opción 1: Reciba un reembolso menos el costo de una noche por villa menos cargos (tax ISH y 4% comisión bancaria). ​Opción 2: Crédito del 100% para ser usado dentro de una año para otra reservación (se excluyen fechas restringidas como Navidad y Año Nuevo y/o días festivos). Opción 1: Reembolso de 50% menos cargos (tax ISH y 4% comisión bancaria). Opción 2: Crédito del 100% aplicado en una estancia futura para ser usado dentro de 1 año (se excluyen fechas restringidas como Navidad y Año Nuevo). 75% de crédito para una estancia futura por villa para ser usado dentro de un año para otra reservación (se excluyen fechas restringidas como Navidad y Año Nuevo y/o días festivos). ó un rembolso del 25% menos cargos (tax ISH y 4% comisión bancaria). 50% de crédito para ser usado dentro de una año para otra reservación (se excluyen fechas restringidas como Navidad y Año Nuevo y/o días festivos). Crédito del 25% para ser usado dentro de un año para otra reservación (se excluyen fechas restringidas como Navidad y Año Nuevo y/o días festivos). Cancelaciones hechas con 5 a 0 días de anticipación. Pago final se vence 30 días (90 días si asiste a una boda) de su llegada, vía Tarjeta de Crédito o PayPal, a menos que se haga un acuerdo alternativo directamente con nuestra oficina. No hay reembolsos o créditos disponibles con ésta opción. Si elige la Categoría B y después hace el pago completo, ésto no cambia su elección original y usted quedará en Categoría B. ​Opción 2: Reciba crédito completo por la(s) noche(s) canceladas para ser usado dentro de un año para otra reservación (se excluyen fechas restringidas como Navidad y Año Nuevo y/o días festivos). 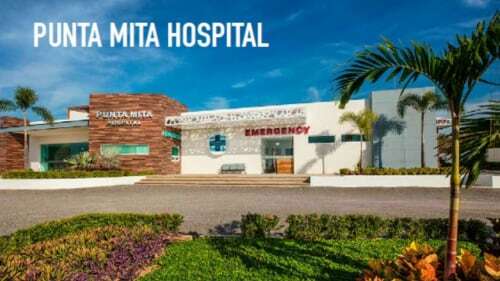 El reembolso aplicará solo si la Villa(s) se puede(n) rentar por la(s) noche(s) canceladas. El reembolso será menos menos cargos (3% ISH y 4% comisión bancaria). para la(s) noche(s) canceladas, y dependerá de la tarifa que podamos recuperar. Cancelación de noche(s) hechas con menos de 60 días de anticipación no recibirán reembolso. Importante: Si usted no está seguro del número de noches que necesita, por favor considere cuidadosamente, ya que no podemos dar reembolsos o crédito para todas las noches canceladas. Por favor reserve solo las noches que usted está seguro que necesita, un mínimo de 3 noches si incluye un fin de semana. Si usted solo reserva 3 noches, nosotros podríamos extender su estancia con al menos un aviso de 60 días de anticipación.